This tutorial is broken up into the sections outlined below. 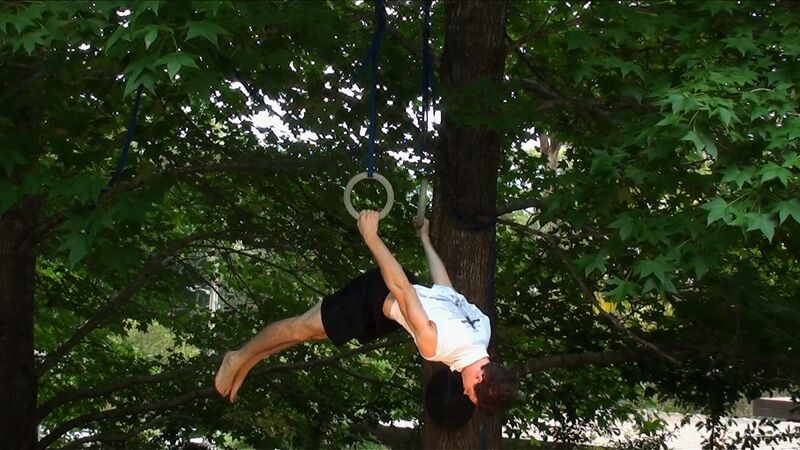 The back lever was one of the first strength holds I achieved on the rings. The move appealed to me due to the intense pressure it places on the elbow and shoulders, and how it activates the whole body in a single hold, not to mention, it is an impressive feat to witness. 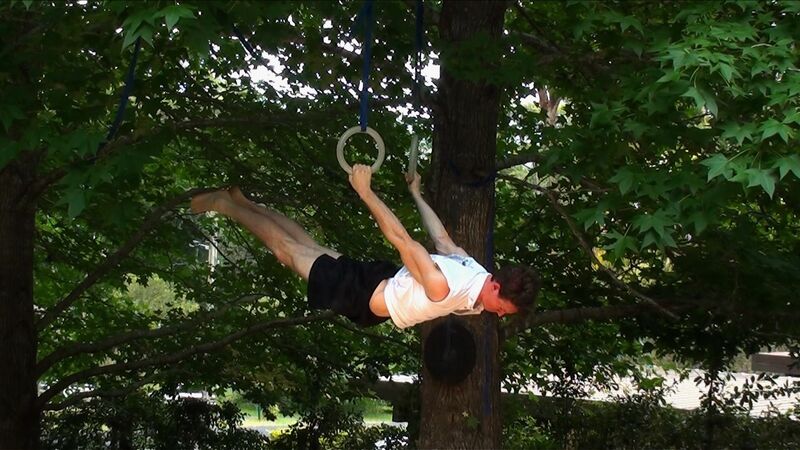 The back lever requires a decent core, good tendon strength and reasonable shoulder flexibility. Therefore, your body does need to be slightly conditioned before attempting this move. It's okay to feel unprepared because this tutorial contains all the information you're going to need. 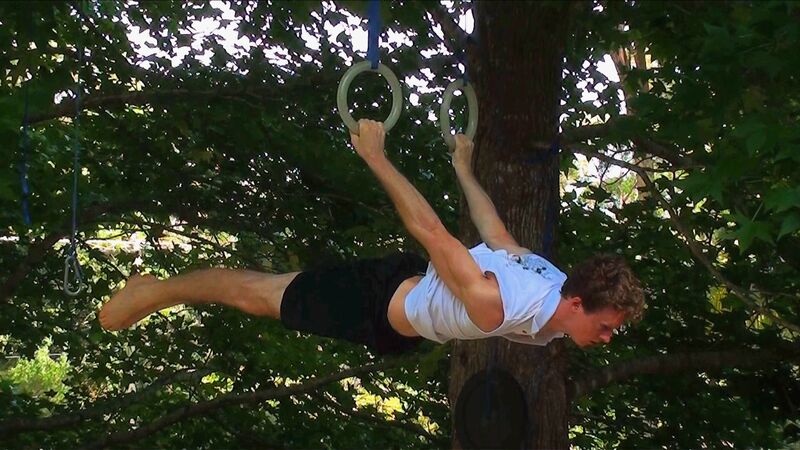 I started training for this move with almost no experience on the rings, and it has helped me greatly with my ring strength, and allowed me to progress onto more advanced moves. In male artistic gymnastics the back lever is an A level rings skill. 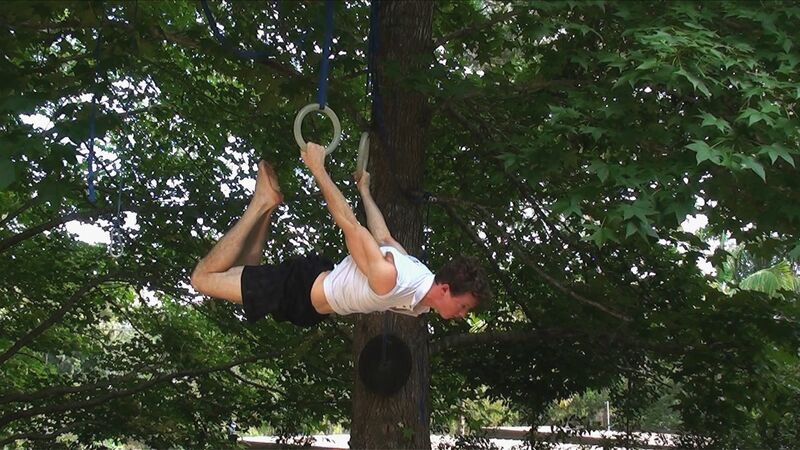 Basically, this means it is one of the easiest strength holds you can do on the rings. It is achievable for a beginner with about 2 – 6 months training. 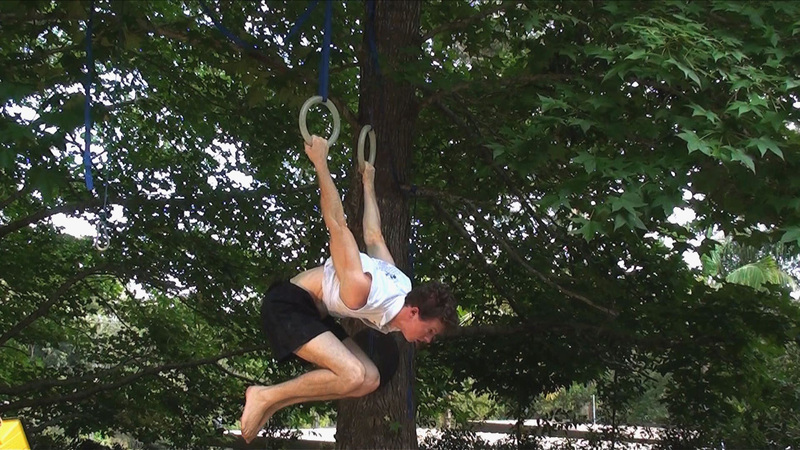 This tutorial covers prerequisites, form, progressions, a full back-lever and some additional information. So let's begin! There are two main drills that you should be comfortable with before attempting the back lever. These drills are also useful to warm-up with. The first drills are dish and superman static holds and rocking variations. Both drills (dish and superman) train a tight body that is needed to keep a level body and prevent the legs dropping during the back lever hold. 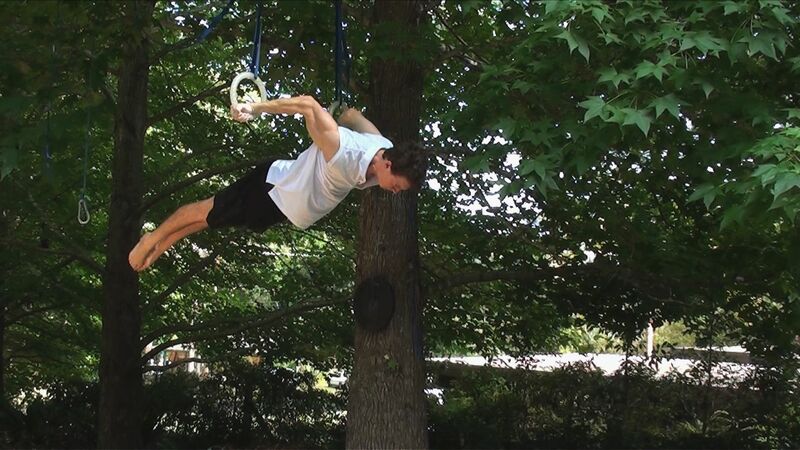 Dish/superman rocks are also useful because they train you to keep a tight body with momentum, an essential skill needed when transitioning to a back lever. 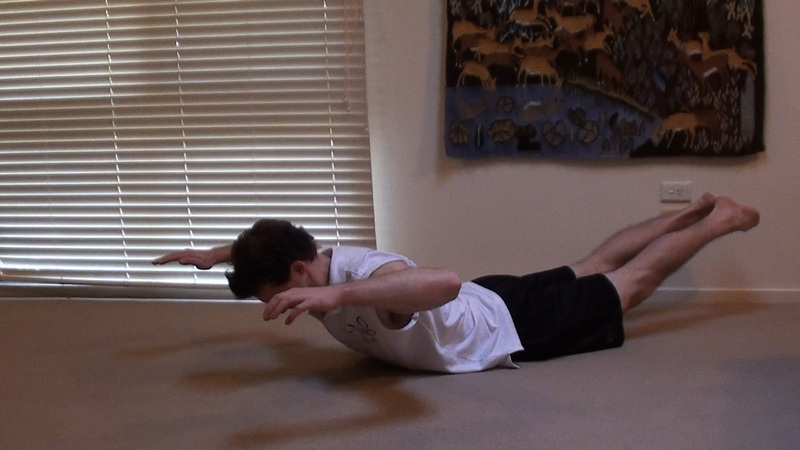 To make the superman drills more simple, you can bend your elbows, and work towards holding straight arms in front of your body. The second drill is skin the cat. 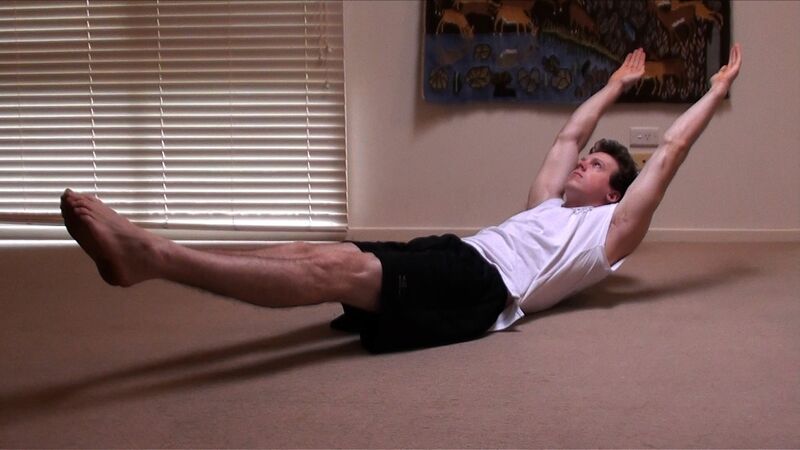 This is a great exercise that builds muscle and tendon strength while also developing shoulder flexibility. 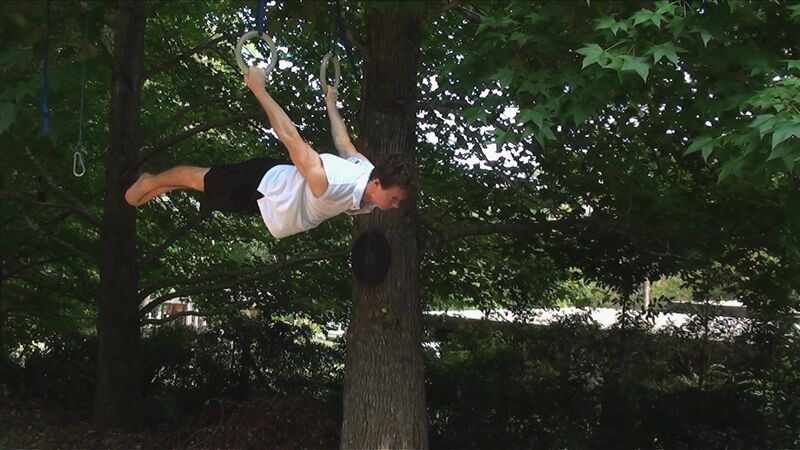 The movement itself is very similar to the back lever. 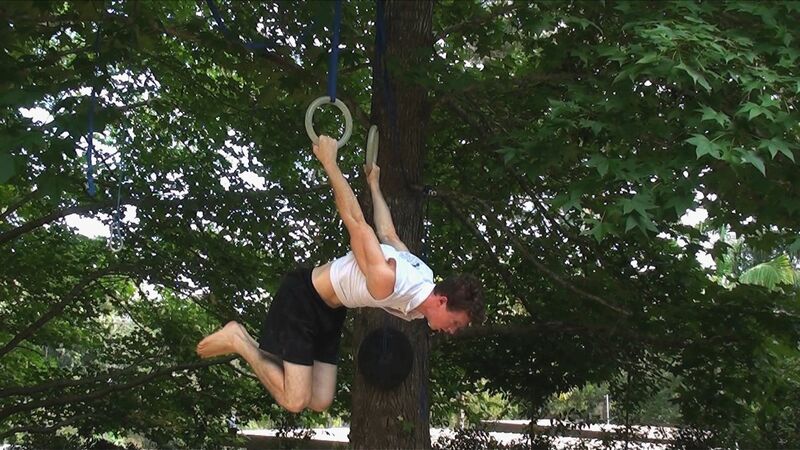 Make sure when you go around you make note to turn the rings outwards and go as far as you can into the movement without experiencing any pain (you will feel your shoulders stretch while lowering into a German hang). Remember a good stretch is uncomfortable, not painful. Make sure your arms remain straight throughout the entire movement. This exercise will be easiest with bent-legs, held in a tuck position. Work towards 45-second dish/superman holds 3 times each, 20 dish/superman rocks 3 sets each and 8 fully extended skin the cats (straight legs). 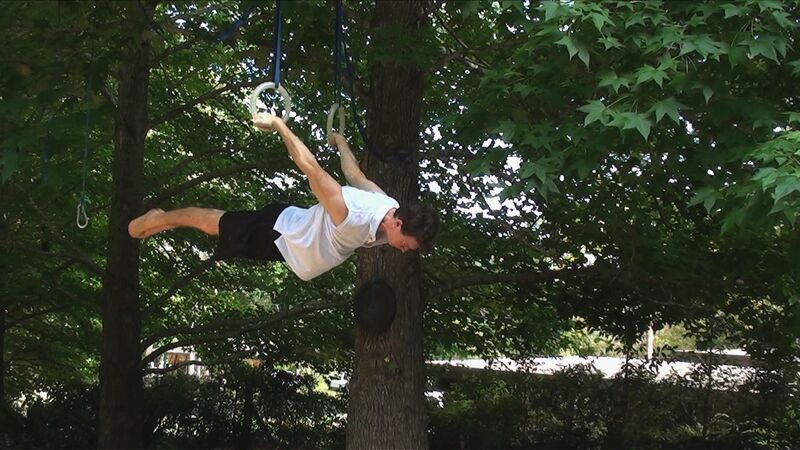 When you can perform these drills your body will be begging, even pleading you for some back lever training. You are now ready to begin training the back lever. Remember, Persistence is the key to achieving your goals. The following key points on form apply to all the progressions and the back lever itself. It is very important to ensure you follow these points as they maximize the strength gained from training and result in the fastest progress and the perfect back lever. Straight Arms - Arms MUST be straight, this will add additional intensity to your elbow joint, and will result in stronger tendons which are essential for this and many other rings skills. Shoulders - Pulling downwards (body NOT sagging). Flat back - Avoid arching or piking. Inside of the hands pointing toward the ground - Some people train back lever with their hands 'backwards' though I believe hands facing down is hands down the best method, primarily because it more closely simulates more difficult elements such as Maltese cross and planche, which require your hands to be facing down. These are likely moves you will work toward after mastering the back lever. Have someone watch - It is beneficial to have someone watching to give you an indication of how level you are. You should make an effort to get critiqued as soon as possible so you can consolidate the muscle memory of how it feels to be level (and hence a beast). Once you can hold each progression for 8 seconds and can perform 5 repetitions with a 2 second hold at the bottom for 3 sets. Then you are ready to progress to the next level. Please note a repetition involves starting in an inverted hang, lowering to the back lever (or the progression you are working), hold it for 2 seconds, and then press back to the inverted hang. The lead-ups for the back lever are simply easier forms of a fully extended back lever. The easiest progression is the tuck. Simply tuck the knees to the chest. The idea is you make your body as short as possible, to minimize the load on your shoulders and arms. You will notice a very subtle shift of the shoulders forward, away from below the hands as you ascend through the progressions. This is necessary to balance as the body is extended. The next progression is the advanced tuck that involves the legs still bent at the knee with the upper leg perpendicular to the torso. The final progression before a full back lever is bent legs where the upper body and upper legs remain straight while the knees are bent at a 90-degree angle. You are now ready to do a back-lever! You should be able to hold the bent-legged back-lever position for 8 seconds and perform 5 repetitions with a 2 second hold at the bottom for 3 sets. What comes next is to simply extend the knee so the lower legs are now parallel with the rest of the body. As mentioned above in the key points on form; take note to keep straight arms, turn the rings out, keep a flat back, look ahead and point your toes. It helped me to flex my entire body to keep it rigid whilst inverted, and then maintaining this tension while slowly lowering into the back lever. This ensured I maintained body tension and the proper shape (not arching or piking). 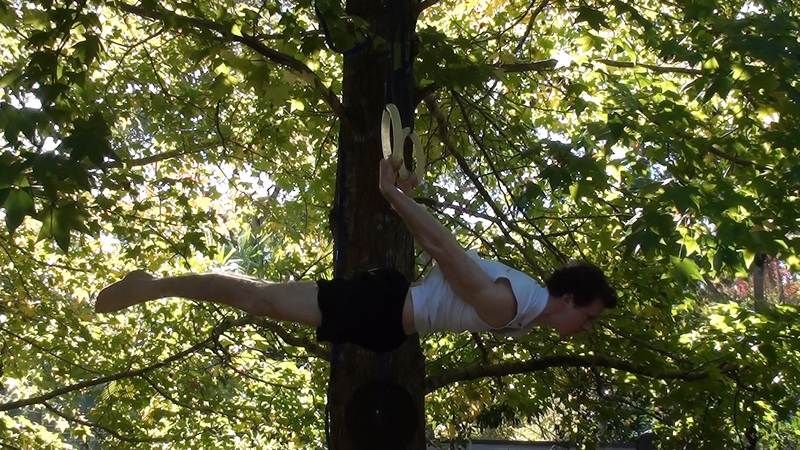 Another variation I want to add as an additional progression is the straddle back-lever. It is do-able before a full back-lever but I left the straddle out of the main progressions because I believe the last progression is better for most as it is not dependent on flexibility (which can make the straddle easier for some and harder for others). I have included it here because it looks nice and sadly, to the untrained eye, could seem more impressive. Lastly are the injuries the back-lever can cause to tendons and muscles. If you do experience any pain in the forearm, inner elbow or bicep you need to rest that area. You will get these types of injuries by overloading your body with effort it is not use to (such as progressing too quickly). Our bodies are adaptable and in time you will be able to do the movement without injury. I've tried to help you avoid injury in this tutorial by allowing controlled progressions that require you to stick to a progression for a reasonable amount of time to build the adequate strength needed to advance to the next level. It is important to remember that muscles grow stronger faster than tendons, so even as you start to get stronger it is a good idea to get very comfortable with your current progression before moving onto the next more difficult level. This should minimise the risk of injury (and hence maximize your strength gains, since an injury will take longer to recover from). Remember to be persistent with your training and patient when results do not happen immediately. It is sometimes a battle between wanting to train and realizing that you need to rest. It is those that can balance these two effectively that will see the best results. 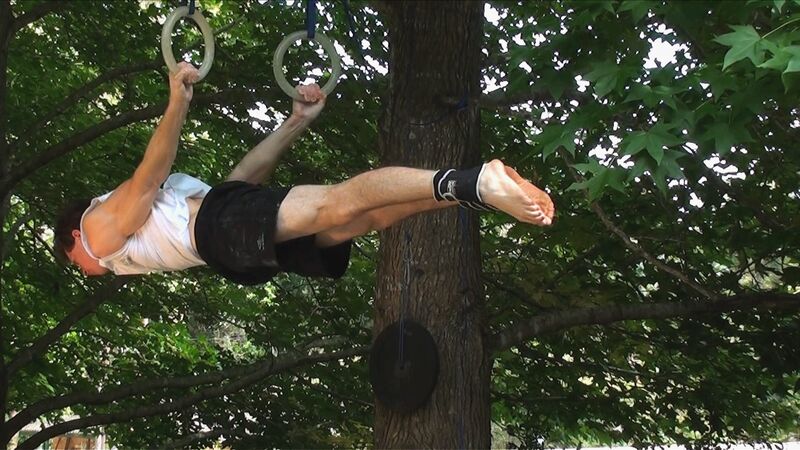 I hope you found both the video and this written tutorial helpful in your training towards the back lever. If you haven't watched the visual tutorial yet, follow this (LINK). Good luck with your back lever. If you want to share your success, air your distress or have any other questions, go over to the FORUM and post a comment!